Our embroidered SUKA-T shirts make for wonderful gifts and souvenirs. We do everything here from planning and design to embroidery. Our special craftsman is in the shop at all times and he proudly creates each embroidery item. We can cater to your specific requests. 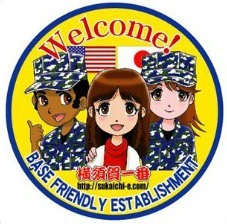 We also sell specially registered Yokosuka T-shirts known as SUKA-T as well as hoodies, zip-up jackets, caps, and towels. All of our products are made with great care by our embroiderer. He is always in the shop, which enables us to meet any of your specific requests. This hoodie has the aircraft carrier Ronald Reagan embroidered onto it, which was newly deployed at Yokosuka in October, 2015. We also sell T-shirts, caps, and hoodies with the same pattern as well. Cranes are popular birds that often appear in old Japanese tales. They are also thought of as auspicious animals in Japan, as a symbol of longevity, just like turtles are. One Japanese proverb states that cranes live for 1,000 years, turtles live for 10,000 years. A Crane and Japan SUKA-T can make for a great souvenir! We have a wide selection of zip-up jackets with beautiful embroidery that is unique to Yokosuka. It can be fun just looking at our different jackets. Please feel free to stop by.